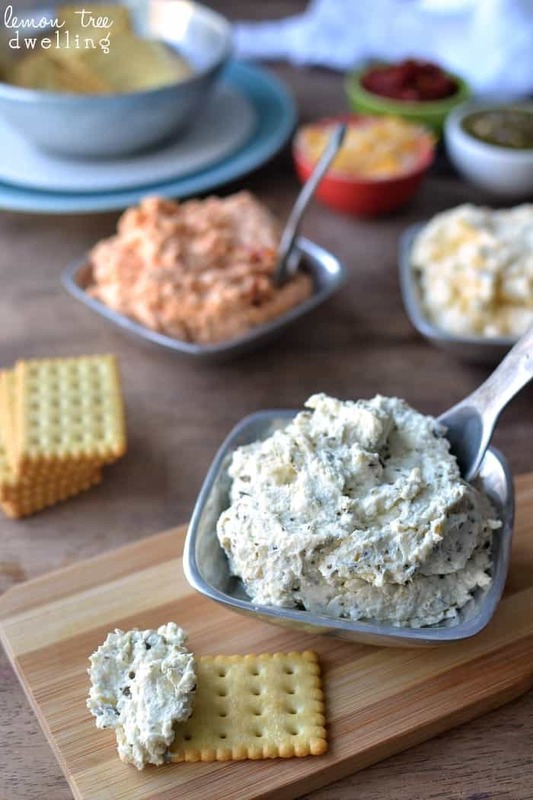 These 3 Ingredient Cheese Spreads will enhance your crackers and cheese snack! 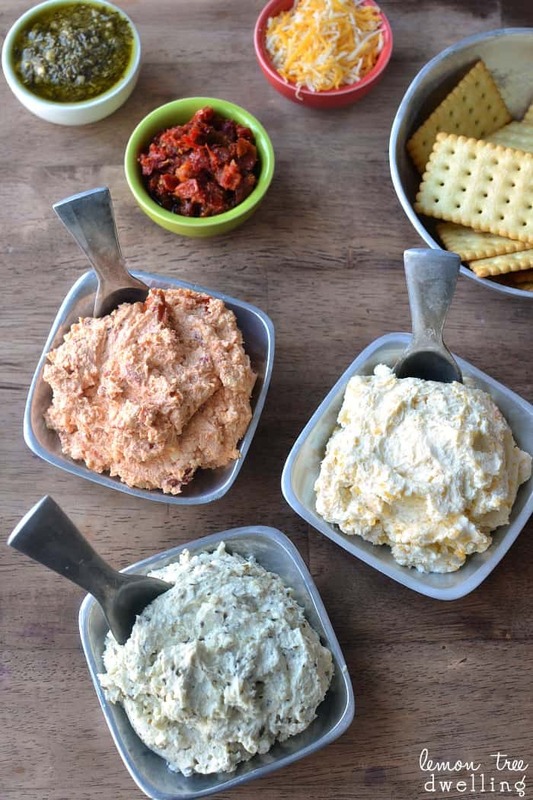 Three delicious cheese spreads made with just 3 ingredients each! 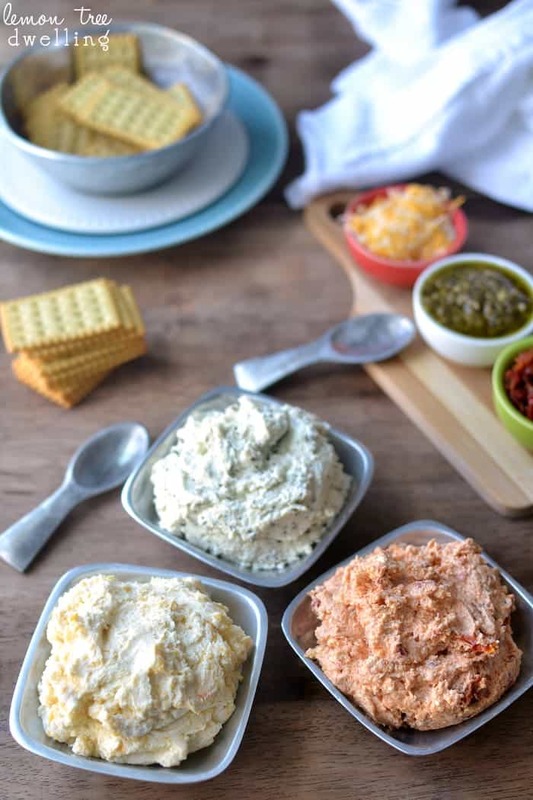 Why choose between Wasabi Cheddar, Sun Dried Tomato Feta, and Pesto Parmesan when it’s so easy to make all three? 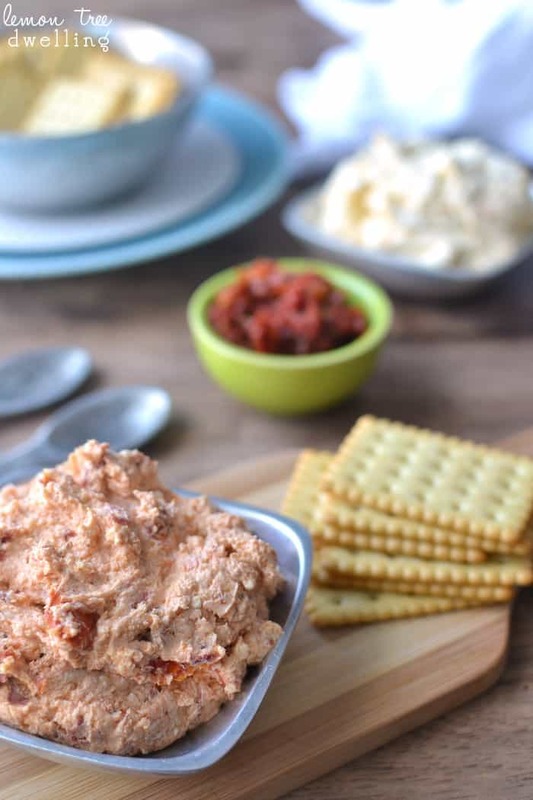 Eat them with crackers, pretzels, or even veggies for an awesome snack or party appetizer! Let’s just get this out there. I’m a complete sucker for anything I can put on top of something else. 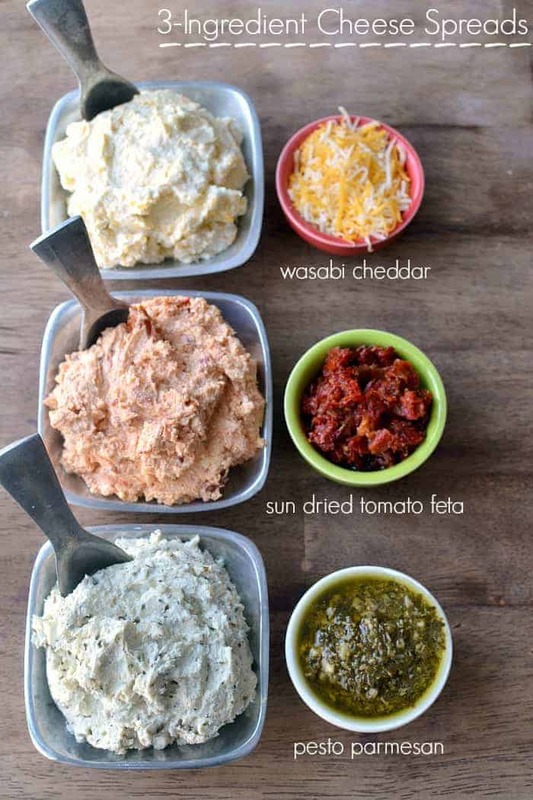 Dips, dressings, drizzles…..toppings of any kind…..sign me up! And plan on me eating more than my fair share. It’s apparent any time we get sushi, and I finish all my soy sauce and ginger halfway through it and have to start dipping into Jorden’s. Or any time we go out for Mexican, and we literally go through 8 little cups of salsa. Or any time I order a salad and have to ask for more dressing before I can finish eating. Or any time you open my fridge and see a disproportionate number of condiments……! What can I say? I love my toppings! I especially love anything cheese and crackery….but I like big, bold flavors, too! Which is why these spreads are perfect. They’re basically cheese (and crackers) with a twist…..of pesto, sun dried tomatoes, and wasabi. 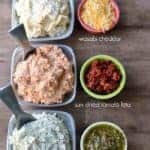 The flavors are bold, the texture is creamy, and they make an awesome snack with crackers, pretzel flats, or even veggies! And just for good measure, each cheese spread has double the cheese. Because the only thing better than cheese is……more cheese! I have to say – I was kind of like a kid in a candy store, searching through my fridge to find the best 3-ingredient combinations. Because when you love dips, dressings, drizzles and spreads as much as I do……these are not decisions to be taken lightly! 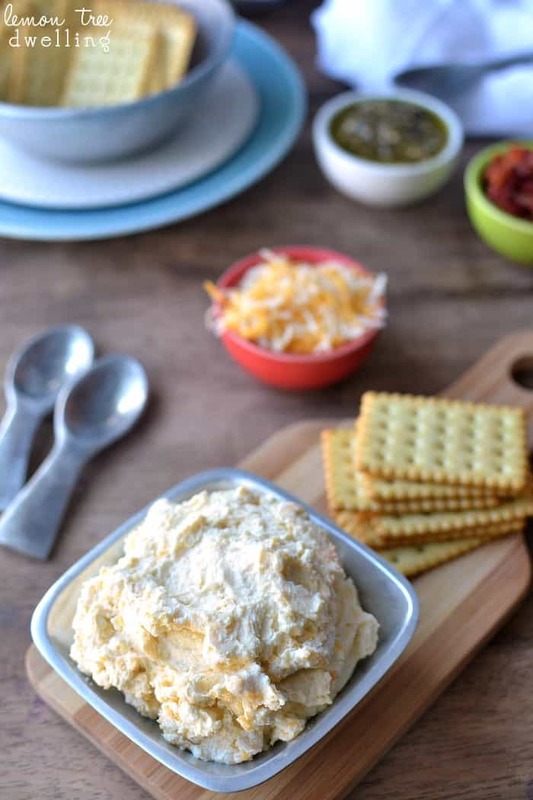 Prepare each dip by combining ingredients in a small mixing bowl and, using a hand mixer, mixing on medium-high speed until thoroughly smooth and spreadable. Serve with crackers, pretzels, sliced baguette, or vegetables. I’m a huge condiment person as well! I love how easy these three spreads are and so versatile! Thank you for sharing these, I can’t wait to try all of them the Parmesan pesto sounds particularly delicious right now! I love these cheese spreads, Cathy! This is always my go-to snack at parties. I’ve never thought to create my own though, so creative! Pinned!